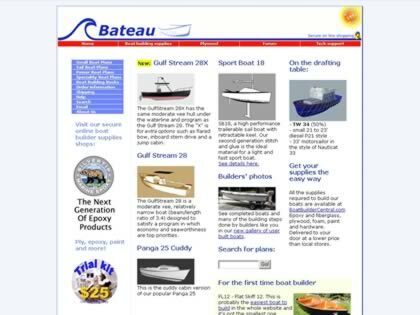 Web Site Snapshot: If available, above is a snapshot of the Bateau Boat Plans OnLine web site at http://www.bateau.com/ as it appeared when this site was added to the directory or last verified. Please Note that Boat Design Net has no involvement with the above web site; all content and images depicted in the above thumbnail are the property and copyright of Bateau Boat Plans OnLine unless otherwise noted on that site. Description: Boat Plans for power, sail and small boats. Free Boat Plans. Kits and supplies plus boat building technical support. Plans for skiffs, small power boats, and sailboats. Power designs include the Phantom 16 and 18 open flats boats and the Mongoose 20. Sail designs include the 20' Vagabond +, 22' Serpentaire, and 30' Corto.